The Canary Home Security System is an all-in-one device with a mission to provide affordable security to renters and apartment dwellers primarily. 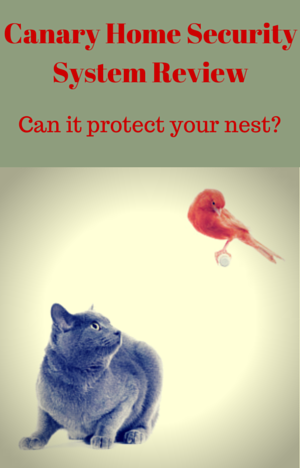 In our review we take a look at whether it can secure your nest. watch a video clip if the device detects unexpected movement. If there is an intruder you sound the alarm and call the police dependent on your assessment of the situation. The device sits on a shelf and is plugged into the power. The control and monitoring of the system is all done with your smartphone using an Appthat is free to download. It’s designed for small homes but it can be used in houses but it will get more expensive as you are going to need more devices to cover the house adequately. Or you could restrict yourself to one to cover the most important areas of the house but taking a risk that you won’t detect an intruder if the break into your house in the areas not covered. The first units of this all-in-one device are just being sent out now. It does look great and it has the potential to be a good system for those who can’t afford a traditional security system or aren’t permitted to install them. From the company’s website it says that most people in apartments or renters don’t have systems. The lack of real world use means that much of this reviews is based on how it is expected to work. As I get more information on how it works I’ll update the review. For now much it is looking at the features and seeing how they could work in the real world and commenting on what seems a good idea and what doesn’t. It is expected to go on general sale from the 27 February 2015. Installation and set up is simple and quick. Installation is just a matter of placing the device on a shelf or table or other item of furniture where it can get the best view of the house to see and detect movement as well as detect changes in the air quality. However, the App for the Android has not yet been released and has a target of being released by the end of January. The company is still shipping the devices to people with Android devices – hopefully there won’t be a further delay in the release of the App. The set up process is to plug it in to power, connect to the internet (WiFI or Ethernet cable)and download the free App to your phone and then you are good to go. It does seem this is going to be straightforward and save on the hassle of attaching sensors around your home. However, the system comes with a micro USB cable and secure set up cable and they are required for set up but there use is not covered in the online instructions and must be covered in the iphone App (I don’t have an iPhone to check). There is no contract with the system. It is planned there will be 4 different levels of service with a basic level that comes with the system and is free, the other levels of service you pay a monthly fee that can be cancelled at anytime without penalty. Basic – Cost is $0.00 – You get motion activated alerts by text, email or push notification, video recording when Armed, the previous 12 hours archive of video recordings and you can save five clips online. When system is disarmed the system does not record video. Never Miss A moment – cost is $9 for first device and $4.50 for each additional device. This gives you 7 days video storage, 50 saved video clips and there is video recording available in armed or disarmed mode. This does give you more time to look at incidents in the home and to save any you want to keep – either as evidence or on a more positive note you can keep any special moments you want to savor. Compared to the Piper system this seems expensive where you can store a 1000 videos for free. Advanced Security – cost is $19 a month for first device and $9.50 for each device thereafter. It provides you the same security as with the previous plan but with 30 days storage and 100 saved clips plus call center monitoring. Deluxe Package – cost is $39 a month for first device then it is $19.50 to add another device. You get the same security and video recording ability as with the Advanced Security but with more storage – 90 days and 250 clips and call center monitoring. For the paid plans when the system is disarmed the system records motion events but does not send a notification to your phone. Support at the moment is offered through their website or by email only. This may change as they move from shipping pre-orders to release to the public at the end of February. Canary offers a 60 day money back for returns and a limited manufacturer’s warranty of 1 year. I contacted them with some questions for this article when they were busy delivering the product and they came back with full answers. The response was a little slow but acceptable. There is one camera per device. It is a 1080p HD camera with a wide angle 147 degree view of the room. It has ambient light sensors that let it determine when to switch from day view to night view and vice versa. During the day the images are in color and at night it is black and white as normal as it uses infra red. Apart from the difference in color the quality of video is expected to be the same. (I’ve not seen a recording so can’t comment on this). The 147 degree view will mean you get to see most of what is happening but there will be blind spots (Piper has 180 degree so has none when placed against a wall but it doesn’t come with night vision) on either side of the camera. To avoid this you could locate the camera in the corner of a room but this may prove difficult if you also want a view of an entrance way. The company has taken a number of steps to ensure access to your camera is secure and private to you with encryption with a key that is 100% unique to you and uses Advanced Encryption Standard (256). When the system is armed the camera is recording video but only sends it to the cloud when motion is detected. It will send a few seconds of video before the event to the cloud and continue to send until motion has stopped. Hopefully the learning algorithm will ignore flies and moths! There is a zoom function when watching the recording – it is a digital zoom not an actual zoom i.e. the camera lens does not zoom in you just enlarge the area of images you are looking at. As this is all online the company has a number of security programs to prevent your data from being hacked or accessed. They use the latest encryption technology and employ third party consultants to check and test their systems. There is more about this on their site. They do take this seriously but as with anything on the internet is anything ever 100% secure but they are taking actions that show they take securing your data seriously. The alarm is housed in the device and is 90 db loud. This is as loud as standing next to truck traffic – it isn’t painfully loud but is loud enough to make you want to get away from the noise. If you are in an apartment the neighbors may notice it but it is going to be much quieter – this fact may be enough for an intruder to leave because as a rule they do not like being seen or to draw attention to themselves. Once you receive a notification and have viewed the video you can sound the alarm or choose to take another course of action such as do nothing or call the police depending on your assessment of the event. The siren is only sounded by way of the app. You can then turn it off manually or set it turn off automatically after 30 seconds. Whenever motion is detected or there is a sudden change in the environment you receive a notification from the device by email, text and/or push notification. Included with the motion notification you’ll also be able to see the recorded video to see what has happened. As well as yourself you can set up the other members of your household (which Canary recommend) to have the same privileges you have to monitor and receive notifications. This is important so when everyone is away from the home the system can then send out notifications to all when there is an incident detected. This gives everyone a chance of responding. When one member of the group responds the other members of the group can see how you responded. To give another level to ensure someone is available to respond you can add backup contacts. So if there is no response from the members of the household within a short period of time the system will then notify the backup contacts – they get the notification and can view a video of the event. So if all members of the household are unavailable because they all have their phones switched off the backup contact can take the necessary action. As long as people have access to the internet with their smartphone they can receive notifications and take the necessary action. Over time the system is supposed to learn from your actions to determine which ones it should consider out of the ordinary and of concern so you are only notified when there is an emergency or you want to be contacted. This helps to ensure there are less false alarms and you aren’t wasting time on things that don’t matter. Initially the system will only storing this information until has enough from all users (anonymously collected) to be able to learn. As well as receiving notifications you can monitor your home via the App using the location dashboard. You can see the name of the location you are viewing, choose to watch a live video stream, see the health of your home, see who is a member of the system and whether they are at home and the current alarm mode. With the live video stream you can check on your home after an alert or you can check up on your pets and kids or may be see what any workers are up to your home from anywhere in the world you can get internet access. There are no batteries for this system. It is powered by the house supply. It does not include a back up battery so when there is no power the system does not work. The Canary Home Security System camera detects motion using a technology called computer vision which I believe it works by comparing images to each other to identify movements. It can do this in a range of 147 degrees (as this is the camera’s vision) and can reliably do this for movement up to 20 feet away. So, if you want to cover a door and see it opening the device needs to be within 20 feet to be sure it detects this happening but you can experiment with this and you may find it can detect the movement further away due to circumstances helping – such as lighting. One of the features of the system that is a recent innovation to security systems is a learning algorithm (not yet switched on). One of the uses for this will be to ignore your pets when they are moving around the house. It will do this by recording your response to a notification and noting it – so when you choose to ignore an event, it will learn from this and next time it won’t send you a notification (pets moving around can be a common cause of false alarms). This is great for ignoring pets but it will be interesting to see what it does with the irregular habits of humans and whether it can learn their routines and doesn’t miss something. I guess this is why the company wants all member of the household to be added as members. There are no doors and window contacts. The system can only detect a criminal after they have entered the premises and not when they have forced a window or door. Privacy – live and motion events are both deactivated. In all three modes you’ll get environment notifications. You can set the three modes with our phone by using the App. When everyone in the household is a member of the App the system will automatically arm and disarm the system by using the location services of their phones as it will know when everyone has left the home and will arm the system and then when it detects someone coming home it automatically disarms the system. There is no need to get your phone out and do this manually, as long as you have phone on you it happens on your behalf. If members of the household don’t have a phone or are not a member of your App the arming and disarming will need to be done remotely by someone who has the App. The only person that can add or delete members and contacts is the owner of the system. There is no control panel and no keypad. There is just the all-in-one device that is controlled and monitored with the App (you can add up to 3 more devices to the App). From the pictures of the App it looks a simple layout that will be easy to navigate. With the App you can add and delete members, read the log of notifications, see the event screen where you can view the video respond to it (sound the siren, tell it everything is ok, call emergency services), save it (otherwise it will eventually be deleted) and help the system to learn. Also view live stream from your home and record it to your location timeline. The system does not have a delay for you to leave your home after it has been armed nor does it have one for when you enter the house and the system is armed. This is a standard functionality for home security systems. It is designed to prevent false alarms. With this system it is not needed as the alarm won’t sound and the araming/disarming is automated by the system tracking your phone’s location services. If the system is unplugged or the internet is down the system does not work. You can’t communicate with the system nor can you tell it to sound the alarm. The safety feature is that you will be informed that the system is not being communicated with. Also if the device is moved you are notified immediately and can take action to determine the reason and whether further action is required. There is only one unit and it needs to located centrally to give the camera and motion sensor the best coverage of your home or apartment. You want it positioned so it has a view of the door and as much of the premises as possible from one spot. This system either is plugged into your router or uses your system’s WiFi to communicate with your smartphone. There are no zones as such. You buy a single unit that incorporates all the tasks. The company recommends you add up to 4 units to your App. From the App you can identify the devices separately to which one you are monitoring or the one that has triggered the alert. In addition to this you need to download the free App for Android or iOS. There are no accessories as such but it does monitor air quality. All the capability is included within the device. At present the company does not intend to release any products that are compatible. This may change in the future. The device is not z-wave or zigbee (home automation communication protocol) compatible so you can’t add third party products to the system to give you automated lighting when there is motion detected etc. The one device has a lot of functionality with a camera, microphone, motion sensor, siren, temperature, humidity and air quality detector. No door/window contacts for detecting an intruder when they are forcing a door or window. The system only detects the intruder once they are inside premises. There are no reviews by customers as it has not yet been released to the wider public yet. The first orders are being shipped to those that ordered it through the indiegogo campaign and pre-release orders are also being fulfilled. The reviews by other sites are positive. They like the simplicity of it and the quick set up time. However, there are concerns which I share about the lack of window/door contacts and the cost for setting up in a house. For a small apartment and renters it looks a good option and you get the basic service package included in the cost of the device. For an apartment or a vacation home with internet access this system gives you a lot of good functionality at a reasonable price and you can use it without paying a monthly fee with limits on video storage and no third party monitoring. You can pay a monthly fee and get more online storage and also have third party monitoring to help with the burden of monitoring your system. For a larger home you are going to want more coverage. To do this you need to buy additional devices as they do not sell sensors that would make it more cost effective. Based on the company’s assessment of requirements you are going to want to have 3 of these – one for each entrance and one for the second floor which will cost you about $750 plus if you want monitoring and/or more storage it is going to cost more each month. You can check current Amazon pricing anad availability here: Canary Home Security System. This system does give you good value for smaller homes and may provide some coverage for those who are priced out of more expensive solutions. The set up looks quick and easy and the App simple to use. However, this is not a complete system as you can not cover the doors and windows, so an intruder must be in the house. Also you must have a smartphone (Android or iOS) for this to work and it is recommended that all users have one and become members. If you are living in an apartment or renting this will provide you with security without anyissues of installation or having to pay for more than you need. It may also be right for those that can’t afford full home security system. However, it does seem to be shipping pre-orders with a number of features not working at the moment. These include no Android app, email and SMS notifications, no notification when there is power outage or the internet is down and no backup contacts.